An island that sprouted out of the Pacific thanks to an undersea volcanic eruption some 600 miles south of Tokyo last month might just be here to stay. Scientists initially guessed the new island would soon sink below the surface — Pakistan's newest island is doing just that — but satellite images show the little mound has actually grown since its birth, so Japan has decided to name it. Niijima, as it's called, is now 19.8 acres or five times its initial size, NBC News reports. And while it may not be a permanent mark on the globe, it's not likely to go anywhere soon. "We don't know the fate of the island," a Japan Meteorological Agency rep tells the AFP. "But it won't disappear in days or weeks, and will probably last for several years ... unless a huge volcanic eruption happens and blows it apart." That assessment is based on part on the fact that a recent satellite image shows signs of ongoing volcanic activity. 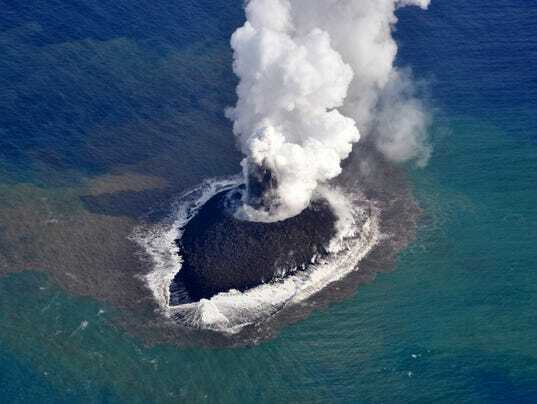 "We are still seeing a wisp of smoke and some ash coming from the islet, and occasionally there is lava belching forth, so the islet may grow even bigger," the rep added. Meanwhile, a different Pacific island nation is sinking.